1 What Is Cervical Radiculopathy? Cervical radiculopathy refers to damage or irritation of the nerve roots within the cervical or neck area. In general, symptoms associated with cervical radiculopathy are localized to the neck, chest, shoulders, arms, and upper back. Irritation and injury to the nerve roots within the cervical area can result in symptoms of pain and discomfort around the neck and upper extremities, along with motor dysfunction (e.g., muscle weakness) or sensory deficits (e.g., loss of sensation) in these areas. In some instances, individuals report sensations of numbness or tingling within the hands and fingers. A recent epidemiological survey reported an incidence rate of 83 cases of cervical radiculopathy among a population of 100,000 individuals between the ages of 13 and 91. This study also indicated that men tended to be more likely to suffer from radiculopathy than women. Previous work has provided support for favorable outcomes among individuals with cervical radiculopathy. An epidemiologic study that included a five-year follow-up survey reported that only 31.7% of patients with symptoms of cervical radiculopathy experienced symptom recurrence during that time. First-line treatment for cervical radiculopathy generally includes an analgesic medication, which can include both steroids and non-steroid medication, and physical therapy. For patients with symptoms that do not remit after trying these methods or whose symptoms are more chronic in nature, more intensive procedures may be warranted. Symptoms of cervical radiculopathy are caused by compression of the nerve root within the cervical spine. Cervical nerves project from the cervical spine (i.e., the neck) at each of the seven cervical vertebrae. These nerves provide motor function to the fingers, hands, arms, and shoulders. Further, cervical nerves transmit sensory information back and forth between the skin and muscles in these areas, and the brain. Thus, cervical radiculopathy may occur at any of the seven locations along the cervical spine. Compression of the cervical nerve roots can be caused by a number of different conditions. One of the most common of these conditions is cervical disc herniation or disc rupture. In between each of the vertebrae that comprise the cervical spine are intervertebral discs. These discs are constructed with a tough, fibrous outer layer and a soft, viscous gel inner layer. This allows them to act as shock absorbers for the vertebral bones. When the intervertebral discs become damaged or irritated they can herniate, or protrude, out. This disc herniation places pressure on the other structures within the cervical spine, including the root of the cervical nerve, causing the irritation associated with cervical radiculopathy. Similarly, stenosis of the cervical spine can also lead to symptoms of cervical radiculopathy. This occurs when the cervical spine begins to undergo changes associated with degeneration. Often, the spaces within the spinal canal begin to tighten, which can place additional pressure on the cervical nerve root. Cervical degenerative disc disease can also lead to cervical radiculopathy. More specifically, when the discs of the cervical spine begin to degenerate over time they are at risk for pinching a cervical nerve. Less common causes of cervical radiculopathy include tumors or spinal infections. Cervical radiculopathy can be diagnosed through a variety of procedures. 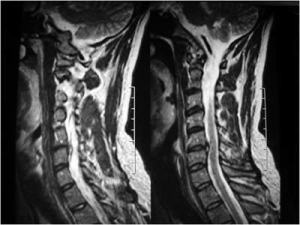 For instance, magnetic resonance imaging (MRI), computed tomographic myelography, and electromyography all may be employed to determine the presence of neurologic compression within the cervical area. Further, these procedures can also be used by physicians to check for the presence of other conditions that may account for the patient’s symptoms. Other tests are available for diagnosing cervical radiculopathy, including the Spurling test (ST), the shoulder abduction test (SAT), and the upper limb tension test (ULTT). These are employed to assess nerve root pain. In terms of pharmacotherapy options, non-steroidal anti-inflammatory drugs (NSAIDs) are shown to be effective in managing neck and back pain. In fact, many physicians regard NSAIDs as their first-line treatment for cervical and radiating arm pain. Augmenting another medication, such as a muscle relaxer, narcotic analgesic, antidepressant, or anticonvulsant, may be beneficial for some patients. Some findings have shown that opioid medications, including morphine, oxycodone, and codeine, are effective in treating neuropathic pain for up to eight weeks. These medications are stronger than over-the-counter analgesics; however, opioids have elevated risk for dependence, abuse, and even possible overdose. Another method of treatment that has been shown to be effective in managing cervical radiculopathy pain is steroid injections. For instance, cervical perineural injections (including translaminar and transforaminal epidurals, and selective nerve root blocks) deliver steroid medication to the affected nerve root, which reduces inflammation of the area, and an anesthetic, which helps to reduce or eliminate pain. Cervical radiculopathy refers to the symptoms associated with damage or irritation to the cervical nerves. These symptoms can include pain and discomfort within the chest area, as well as the upper extremities. Other symptoms may include sensory deficits and motor difficulties. There are a variety of causes for cervical radiculopathy; however, a number of techniques are available to confirm the presence of neurologic compression within the cervical area. Outcomes for patients with cervical radiculopathy are good. Treatment recommendations can range from immobilization to steroid injections. Many of the treatments available for the neurological pain associated with cervical radiculopathy are highly effective in providing symptom relief. Patients are encouraged to speak with their physician about these treatments, along with their associated risks and benefits. Ghasemi M, Golabchi K, Mousavi SA, Asadi B, Rezvani M, Shaygannejad V, Salari M. The value of provocative tests in diagnosis of cervical radiculopathy. J Res Med Sci. 2013;18(Suppl 1):S35-S38. Ghasemi M, Masaeli A, Rezvani M, Shaygannejad V, Golabchi K, Norouzi R. Oral prednisolone in the treatment of cervical radiculopathy: A randomized placebo controlled trial. Res Med Sci. 2013;18(Suppl 1):S43-S46. Kuijper B, Tans JT, Schimsheimer RJ, van der Kallen BF, Beelen A, Nollet F, et al. Degenerative cervical radiculopathy: Diagnosis and conservative treatment. A review. Eur J Neurol. 2009;16:15-20. Manchikanti L, Cash KA, Pampati V, Wargo BW, Malla Y. Management of Chronic Pain of Cervical Disc Herniation and Radiculitis with Fluoroscopic Cervical Interlaminar Epidural Injections. Int J Med Sci. 2012;9(6):424-434. Onks CA, Billy G. Evaluation and treatment of cervical radiculopathy. Prim Care. 2013;40(4):837-848. Park Y, Ahn JK, Sohn Y, Jee H, Lee JH, Kim J, Park KD. Treatment Effects of Ultrasound Guide Selective Nerve Root Block for Lower Cervical Radicular Pain: A Retrospective Study of 1-Year Follow-up.Ann Rehabil Med. 2013;37(5):658-667.